Pediatric Hair Solutions uses a method scientifically proven to eradicate lice and their eggs in one 30 minute treatment. 98% of lice have developed resistance to over-the-counter and prescription treatments, resulting in an effectiveness rate as low as 20%. Unlike these products, our professional device uses controlled, heated air, to dehydrate lice eggs. You’ll leave our clinic lice free! We offer 3 Treatment Options and we customize services based on the needs of each family. Our Home Kit is for those interested in the traditional method of nit removal at home. We provide the tools, products and education needed to eradicate head lice on your own. The Home Kit includes two bottles of Treatment Solution which suffocates the live bugs, one bottle of Enzymatic Mousse that loosens the eggs to help with combing, and a professional-grade lice comb. The price of the home kit also includes pre and post head checks at our treatment center and 24/7 support throughout the process. Additional treatment solution may be needed depending on how many positive heads and volume of hair. 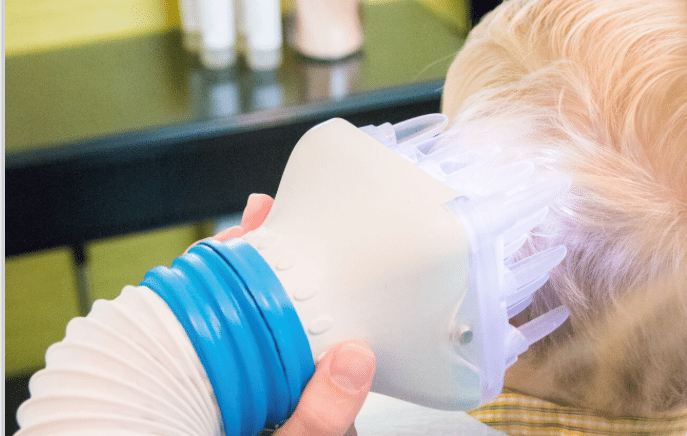 Our FloSonix medical device works heated air through the hair in a timed and specific pattern. The device dehydrates lice and their eggs. We follow with a complimentary comb out to remove empty eggs casings for cosmetic purposes. You’ll leave our treatment center lice free, with clean and dry hair and can immediately return to normal school or work activities. Prior to your appointment with the FloSonix device, pre-treatment solution is applied at home to kill all live bug activity. After your FloSonix treatment, we recommend applying treatment solution 3 times on specified dates following your in clinic treatment in order to qualify for our 100% guarantee. This step helps guard against reinfestation as you return to your usual environment. For our Full Service option we complete every step of the treatment process in one visit. Our treatment providers apply pre-treatment solution that kills the live bug activity. The solution soaks on the hair for 20 minutes. This is followed by a shampoo and rinse and we dry the hair completely. We then use the FloSonix medical device to dehydrate the eggs/nits followed by a complimentary comb out to remove empty egg casings. You’ll leave our treatment center lice free, with clean and dry hair and can immediately return to normal school or work activities. We recommend applying treatment solution 3 times on specified dates following your in clinic treatment in order to qualify for our 100% guarantee. This step helps guard against reinfestation as you return to your usual environment. I THINK MY CHILD HAS HEAD LICE, NOW WHAT? Head lice is very contagious and should be treated quickly to prevent it from spreading to others. It's recommended all members of a household be checked. Anyone who is positive should also notify those they've been in contact with. HOW DID MY CHILD GET LICE? Head lice is spread through direct, head to head contact. This can occur at home, school, the playground, camp, through selfies, etc. Personal hygiene is not a factor. IF ONE OF MY CHILDREN HAS HEAD LICE, WILL OTHER FAMILY MEMBERS HAVE IT ALSO? It's recommended that all family members be checked by a professional if you suspect someone in your home has lice. About 80% of mothers whose children have lice are also positive. HOW CAN I TELL IF MY CHILD HAS HEAD LICE? Head lice are most commonly found near the scalp, behind the ears and neckline. You may find an adult louse or baby (nymph) on the scalp or hair but they move quite fast. If you have lice, you will have nits/eggs on your hair. Nits are usually found within 1/2 inch of the scalp. They are small, teardrop-shaped eggs that are white to yellow in color. The darker your hair, the lighter the nits will appear. Nits are essentially "glued" to the hair. They will not move without being pulled with some force with your fingernails. Dandruff or debris will not be stuck on the hair and will move if you brush or blow on it. Yes, all of our products are non-toxic and free of harmful chemicals. WHAT SHOULD WE EXPECT AT YOUR TREATMENT CENTERS? The treatment centers are extremely clean and sterile. We clean and disinfect every surface that our clients come into contact with – after each treatment. We have strict protocols in place to ensure that no cross-contamination takes place. We abide by HIPPA guidelines and the identities of our clients are strictly confidential. Our friendly staff are skilled at putting children and their parents at ease during the treatment. 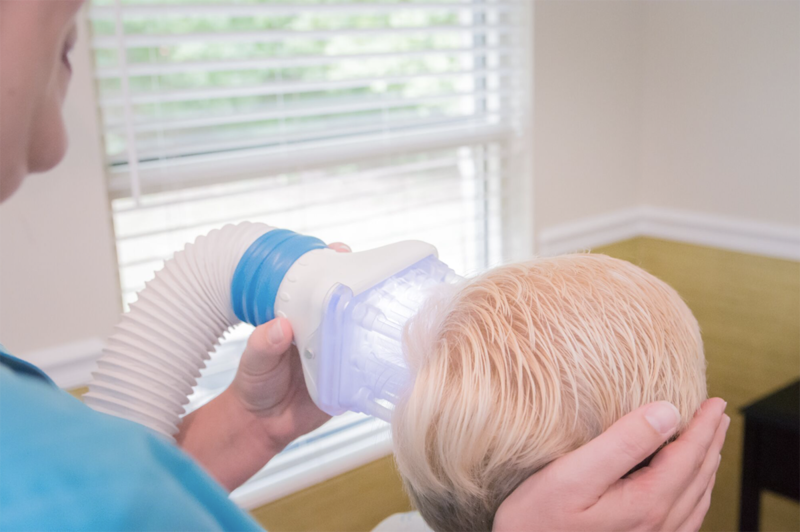 The heated air treatment takes approximately 30 minutes, and is followed by a complimentary comb out which takes between 10-30 minutes. HOW MUCH DOES LICE REMOVAL COST? Treatment at Pediatric Hair Solutions cost is the same regardless of the length or thickness of your hair. Our fee is also per head, not per hour. Visit the Services page for specific information on our treatment options. Along with our heated air device treatment, we also have a traditional home kit you can use at home. It is very common for close family or friends of infested individuals to also have lice. It is strongly suggested that you have everyone in the household checked. There is no need to treat anyone who does not have head lice; however, we suggest you continue checking everyone every few days for at least 10-15 days. IS HEAD LICE TREATMENT REIMBURSABLE BY INSURANCE OR MEDICAID? Treatments at Pediatric Hair Solutions are reimbursed by many insurance plans. We provide patients with pre-filled forms to submit to insurance providers. We also have a 100% reimbursement rate with Flexible Healthcare Spending Accounts and Health Savings Accounts. Medicaid does not cover our services. WHY CAN’T WE JUST USE THE OVER-THE-COUNTER OR “HOME REMEDY” OPTIONS TO GET RID OF HEAD LICE? A 2016 study found 98% percent of head lice have developed resistance to most common over the counter treatments. We can corroborate that finding; the vast majority of our clients have tried one or more of the over-the-counter treatments and still have live bugs before calling us. While home nit-picking is always an option, we don’t recommend some of the other treatment options you may find on the internet. Pouring Listerine, alcohol, vinegar, kerosene, or similar liquids on your child’s head is not only ineffective – it is dangerous! Many times, even the less extreme home treatments will irritate your scalp or damage your hair. If you opt to try treating at home, you need to be prepared to set aside a few hours each day (per child) for the next two to three weeks in order to eradicate the problem…keeping in mind that even one missed egg will start the infestation over again. 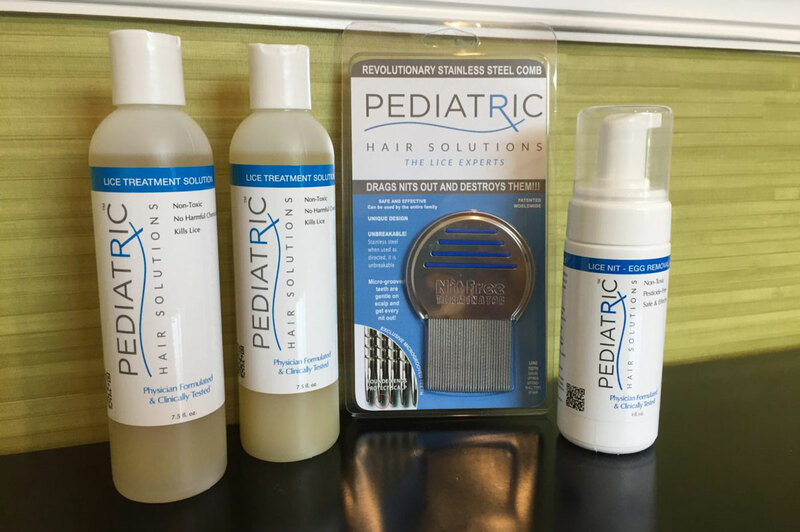 Pediatric Hair Solutions does offer a traditional home kit that will give you the tools and information you need to complete this process. HOW DO I TREAT MY HOME FOR LICE? CAN LICE LIVE ON HARD SURFACES? It is important to remember that the infestation is on the head – not in the home! The first thing to remember is head lice cannot live off the human host for more than 48 hours. Also, lice do not have “feet” and cannot travel on smooth hard surfaces. Lice cannot jump or fly. Nits/eggs need to be in a warm, dark, moist place to incubate. Please do not use a pesticide spray on furniture, lice are resistant and the use of pesticides can have harmful side effects. Home cleaning guidelines we recommend include: Clean all bed and bath linens that have come in contact with affected individuals. Place clothing, linens, etc in the dryer on high heat for 30-40 minutes. Do the same with clothing and outerwear worn within 48 hours. Vacuum or lint brush carseats and furniture where there has been contact within last 48 hours. All hair brushes and accessories need to be placed in baggies and put in the freezer for 48 hours and then washed thoroughly in hot soapy water. Label these items in the future so they are not shared. Sports and bike helmets go into freezer for 48 hours. There are many items that cannot be placed in the dryer, but must also be treated. Isolation is the best method for dealing with these items, including headphones. You should expect these items to be out of commission for at least 48 hours. WHY ARE LICE SO HARD TO GET RID OF? Over the counter and prescription products only treat adult lice, not the eggs. Every single egg must be manually combed out or they will hatch and the infestation will continue. In addition, lice have mutated to become resistant to the most commonly used over the counter and prescription products. The effectiveness rate can be as low as 20%. No, head lice don't jump, fly or swim. They are kind of like monkeys on a vine. They have claws and can crawl quickly along the hair shaft. If your hair comes in contact with an infested head, a louse is able to grab onto a strand of hair and make its way to your scalp. WHO IS AT RISK OF GETTING HEAD LICE? Anyone can get head lice! The spread of lice has nothing to do with personal hygeine, your home environment or ethnicity. WHAT SHOULD I CLEAN AFTER A LICE INFESTATION? It's important to remember lice cannot live off the head longer than 24-48 hours. Still, there is some basic cleaning that should be done on the day your family member is treated for lice. Place bed linens and clothing that was recently worn in the dryer on high heat for 40 minutes. Water does nothing to lice so you don't need to use the washing machine. Lint brush/vacuum car seats and furniture where there has been contact within the last 48 hours. Hair brushes, hair accessories and anything that cannot be placed in the dryer should be isolated for 48 hours. CAN LICE LIVE IN MY HOME? Head lice do not live in the environment. Lice are human parasites and cannot live off the human host for more than 24 to 48 hours. It is recommended you do some basic cleaning of linens/clothing and isolate hair products for 48 hours. Do not use fumigant sprays or fogs. They are not necessary or effective and can be toxic. HOW CAN I PREVENT THE SPREAD OF HEAD LICE? Avoid head to head contact during play, sleepovers, or other activities at home, school, and elsewhere. Do not share combs, brushes or towels used by infested person. Do not share clothing such as hats, scarves, coats, hair ribbons or barrettes. For girls, wearing hair in tight buns or braids is very helpful. CAN LICE MAKE YOU SICK? DO THEY CARRY DISEASE? Head lice are a nuisance but are not dangerous. They do not carry any type of disease. CAN LICE SPREAD IN A SWIMMING POOL? Head lice cannot swim and cannot spread in a swimming pool. Yes, we people of all ages, including adults. ARE THE TREATMENTS AT PEDIATRIC HAIR SOLUTIONS REIMBURSABLE BY INSURANCE? 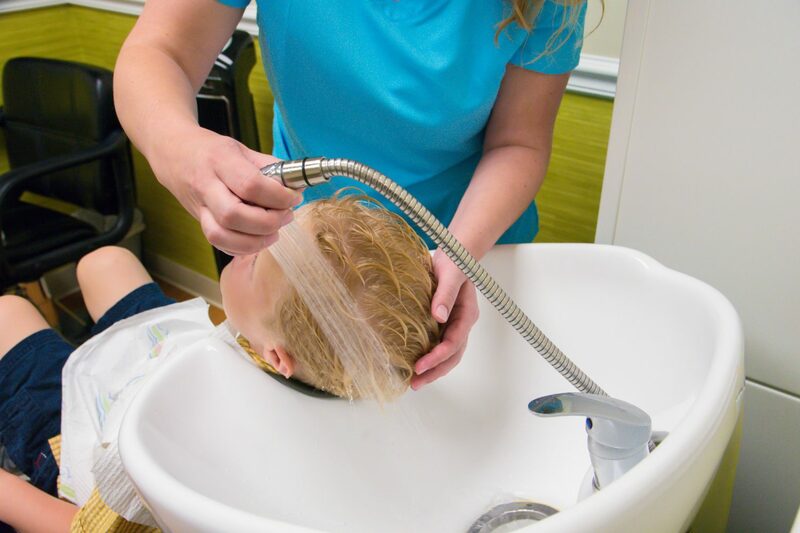 Treatement services at Pediatric Hair Solutions are reimbursable by many insurance plans. We also accept Flexible Spending and Health Savings cards. We provide you with pre-filled forms needed to submit claims for reimbursement. ARE YOUR TREATMENTS SAFE FOR PREGNANT AND NURSING MOTHERS? Yes, our non-toxic treatment solution is safe for pregnant and nursing mothers, and toddlers.